Encontrado próximo a Muralha do Sul, coordenadas do TomTom /way 42 66 às 21:42 horário de Brasília. Easy kill. Not much more difficult than any of the other orcs wandering around. Also he's a spell caster. He is not a spellcaster and it not like any other orc, he is a melee, and a has almost the double HP of the others, although it's not that hard. He has a knock-back so watch out for other orcs; but overall he's fairly easy to kill. He also does a whirlwind and enrages below 25% or so. Easily soloable on my 61 warrior. I got an "of Strength" flavor Hauberk. Found wandering up and down the path of glory, roughly double the HP of the other orcs does a knockback and whirlwind, dropped a 'Demon Forged Hauberk of Nature Protection' for me. wished he dropped the robes, but a Demon-Forged Hauberk of the Bandit , is nice too. anyone know the respawn time on him? He'd be great to farm considering he always drops a BoE blue when you kill him. anyone know if the weapon he carries is found anywhere else as a drop? And also a quest item in Nagrand http://www.wowhead.com/?item=25603#. He dropped Demon-Forged Chestguard of Strength and is an easy solo. I killed this guy today as part of farming the Bloody Rare achievement. I found him down on the Path of Glory. As for his spawn timer I can say for sure that it was _at least_ 9 hours. I spotted him one evening around 9PM EST, the next day around 12:20AM EST. Been hunting for him for a few days... he and Doomsayer Jurim are the last two I needed for Bloody Rare. Found him walking around outside Zeth'Gor at 2:11 PM server time on Khaz Modan, and had scanned for him in the same area about an hour earlier -- he wasn't there then. So he's not just an evening spawn. I have now taken 3 days off of work, so I can find and kill this mob. Been over a month and nothing. Killed at 41 71. Took me maybe 5 minutes of searching in the spots to find. Was easy to kill especially for a dk. Dropped Demon-Forged Chestguard of spell power. He's a Blademaster. He wears no armor above the torso (except for shoulders). The two-handed blade he wields is identical to that of Blademaster Lantresor's (http://www.wowhead.com/?npc=18261) as well as the quest reward Lantresor gives (http://www.wowhead.com/?item=25603). The only other thing missing is the sashimono flying at his back. Also is it confirmed that he spawns at Zeth'gor? killed him on my death knight while headed back to hand in a quest i forgot to do i wasnt even searching for him. While running past zeth'gor he attacked me. I didnt even notice until i saw that his text was from a named mob. Turned around killed him and got the demonweave raminent of the owl. I found him around 45,44 at the Northern Rampart where it is separated. I can't say that he was easy on a lvl 60 destruction warlock because of the fact that I nearly died but I was able to solo him (with a voidwalker). Chaos Bolt turned out to help a lot with it doing 1000-2000 damage. He does about 200 damage on cloth armor and aside from Whirlwind and Enrage, he wasn't that tough. He dropped Demon-Forged Chestguard of the Owl(Plate +31 Intellect, +31 Spirit). I'm having the hardest time with this one. Anyone got an idea for his spawn timer? Came across this guy by complete chance on my Dk this evening. Got my achievey, some blue plate tanking chest piece and a bit of coin. One aggro he says "Once I've hacked off your limbs, I may hang your body from our battlements." Kinda ironic as he is a giant softy. Had no problems as a 61 Blood DK. Killed at 3:35pm server time. Hope this helps someone. Of course you didn't. All the Outlands rares used to be rare-elite, just like the ones in Northrend are now - except the ones in Outlands actually required more than one person, unlike current Northrend rares. They were all changed to just regular mobs, I think with release of WotLK. They still hit a little harder and have more hitpoints than other mobs of the same level, but by and large they are all pretty easy kills for anybody at or above their level. Just saw him pop and killed him at 2:20pm EST. No idea when he'd been up last. More than a week looking for this one. Its the only one missing... I went at all kind of hours. And what bothers me the most is that theres always somebody around those zones killing the orcs, due to the quests. : / Makes it even harder!. The hard part for the Bloody Rare achievement is that Mekthorg the Wild and two other rare NPCs are located in the first area of the Outlands so you might only see dead rare NPCs, because people will accidently run into them while questing and kill them or switch to their main characters to kill them. Anyone have cordinates of where they killed him? Hes the last one I need as well. I even got all the northrend ones before Ive ever seen this clown. He patrols (like many of the rares do), so as others have mentioned, he may be difficult for you to find before someone leveling in the area kills him. Upon aggroing him, he said the following: "Once I've hacked off your limbs, I may hang your body from our battlements." He's really not that difficult though. He does frenzy when low on HP. I just witnessed the fire elementals from the Cataclysm world event killing him. Looks like the npc's want his blood, too! 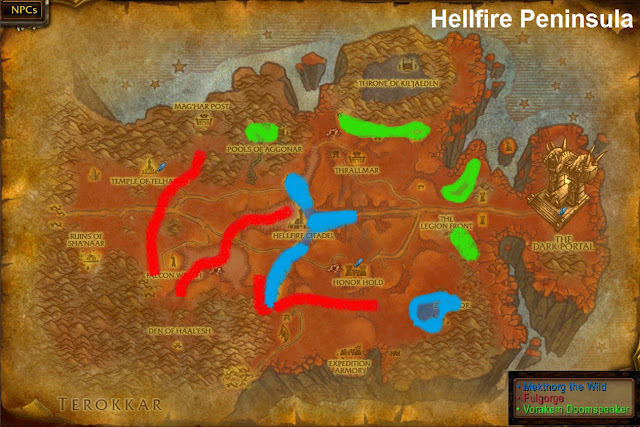 Hard to find him (also the ones in Zangarmarsh)compared to the rares in other Outlands zones, because most 58+ chars only level in Hellfire Peninsula, Zangarmarsh, do the group quests in Nagrand then move to Northrend.So if there are people online in Outland, they are most likely in these 3 zones :P . Also , some of his patrol area is next to the 3 pvp objectives so even lvl 80 come arond from time to time to get Thrallmar rep buff. I've read over previous comments trying to get an idea on what this guys Spawn timer is... and all I see are BS comments. But anyway, so far I've been camping this guy for 2 hours. No spawn. Will update once I find him. a friend of mine and myself just spent about an hour searching all his spots and no luck. Anyone figure out his timer yet? been looking for him randomly for 9 months...no go. Last of my Bloody rare acheivement. Walked up behind me and a mate during he´s drillmaster quest. just found him at 44.1 46.0 server time 11:40 on Grizzly Hills walking around. he was my last for Bloody Rare, so good luck to you all! but he's out there don't give up the fight! Killed him a few weeks ago by accident. Just fyi, Mekthorg has a very short range for NPCScan to pick up. I did a thorough sweep of all his spawn areas, then came back to the Zeth'Gor and hovered overhead near the center of the overlay _NPCScan Overlay provides for his area, checking email while I waited for my hearth to be available. When I came back to the game about three minutes later, I flew to the end of Zeth'Gor just to be certain it was clear before I left, and sure enough, that's when NPCScan went off. There he was, dead, with a mage playing nearby. wow... ran into him. its a good thing i had turn ins, otherwise i would have NEVER found him! i was flying over, looking at my map. just then, the screen got all red, and i was SURE another elite 70 flying around got me. i closed the map, and NPCscan was off! man, i could hardly even think about the drops! i flew down, and eventually found him. although i pulled 2 others, lets just say lucky. Found and killed at 42,65 6:12pm US-Burning Blade walking away from Hellfire Citadel. I found him about 2:30am EST @ about 51,50 on Hellscream. I am a lvl 78 Destru-Warlock with a Fel Hunter demon. He went after my demon, I stood back and through some dots on him, then Summon Infernal then just some random order spells and he went down rather easily. I found him, as I was just doing a flyby, @ about 2:30am EST @ about 51,50 on Realm Hellscream. I am a lvl 78 Destru-Warlock with a Fel Hunter demon. He went after my demon, I stood back and through some dots on him, then Summon Infernal then just some random order spells and he went down rather easily. Mekthorg the Wild: Found and brutally slaughtered 4 hours into a hunt for Fulgorge. Npcscan horned Fulgorge, already had been hanging out at HH for a couple hours. Immediately I set about on his patrol routes. 4 hours and no Fulgorge later a guildmate spotted Mekthorg right under the Citadel. Flew in for the kill and npcscan picked him up right as I neared the citadel very short range, and slayed him ruthlessly at the start of his patrol area there. The true fight is locating these rare targets and being the first for the kill rather than finding their corpse. Located him at 8:27pm Shadowsong US realm time at 66.6, 76.8- east of the keep at Zeth'Gor. 46 42.8 found him at this location , droped a first of my medium rare. Mekthorg the Wild said "I crave your death!" in the split-second it took to kill him. He has four spawn points, three around Hellfire Citadel and one down in Zeth'gor. He is a blademaster, very much like Lantresor da Lâmina yet a Fel orc. This Fel Orc tends to be one of the last NPC's people tend to need for the Extinção Brutal. After EXTENSIVE camping, me and my fiancé concluded that he has a respawn timer of 11(Eleven) Hours. This counting from the moment the corpse of the earlier spawn has disappeared. I hope this helps the rest of you all out! After quite some time searching for this guy, I am happy to say that at 4:51am server, Whisperwind US, Mekthorg the Wild has died by my hand. I found him at 45,59. He has a really long respawn timer as many have said, and he is more difficult to kill because many people quest here for at least a short period of time while leveling. Túnica Curtida pelo Demônio of the Bandit. This character is hard to find as well as Doomsayer Jurim and Nuramoc. Always spawns in two places at the Zeth'Gor (where only one time got it) and to the south of the Hellfire Citadel, on the road (found him dead once). Killed him, level 90 hunter no problem. killed 7/11/14 on duskwood realm, 9:05 pm server. I don't know if anyone still looks for this guy, I accidentally killed him while doing the horde quest to free the goblin dudes in the cages and kill the shattered hand. I don't use NCP scanner so didn't realize I had a rare until the ach popped up! He just kinda tagged in the fight while I was killing other mobs. I found him by the Hellfire Citadel wall, around 47,44. I was pleased to see the ach bloody rare is an account wide ach, I apparently didn't have this one! Esse PNJ pode ser encontrado em Península Fogo do Inferno (49).